In the user experience field, the small details that go beyond expectations and make the difference when it comes to an enjoyable experience, are often called delighters. Many times delighters spring from a single team members will to show off their talent, out of love for a project or love for the end user. 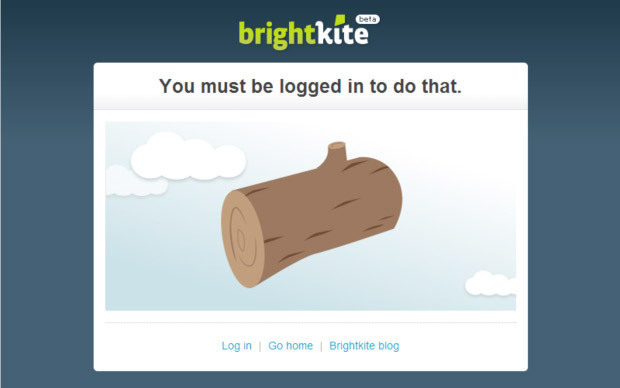 Activities that make your site more enjoyable should however not be left to chance but rather be planned for in advance. Planning for and thinking about enjoyability throughout your project can set your site apart from the competition and engage your users emotionally. There has also been some talk about playfulness lately. Playfulness is another example of how to achieve enjoyability. Emil Ovemar UX Director at Bonnier R&D recently wrote a good post on playfulness. Whatever you choose to name your attempts at making your site enjoyable, delightful or fun to use, you should approach these activities with some caution. Trying to make your site enjoyable may never come at the cost of the foundations of good web design (structure, interaction design, usability, etc). Creating enjoyable experiences must also be aligned with your clients design strategy, brand and identity. Without this, doing any of the following will likely only help you waste time. Read on for some examples. Tweetie´s developer got this just right in version 2 for the iPhone. The drag to refresh gesture is basically impossible not to play with as if it were a rubber band. It quickly feels natural and coupled with great audio feedback it does leave you with a bit more satisfaction than what tapping a button would. My only concern might be the enormous number of unnecessary extra requests this must generate for Twitter. Update: Regardless of which twitter api client you use, you get 70 150 total requests per hour. Incorporating humor can be tricky as not everyone will appreciate your sense of it no matter how funny your copywriter is. Working with humor in microcopy can work as it does not feel very intrusive and also shows a level of humanity. A positive humorous experience is also more likely to be remembered, a factor to keep in mind when trying to build long term relationships. Remember that you are communicating with humans (most often) not machines. An error message reading HTTP Error 503 – Service Unavailable might be decipherable to the average user. It will however not spark the same type of emotions as the Twitter “Fail Whale”. Sometimes these emotions evoke more or less healthy expressions of creativity with the end user. The Mac OS X login prompt is a great example of not having to spell everything out in words. It simply shakes its head or shrugs off the incorrect password attempt. Receiving something well designed, funny, informative and above all highly personalized without knowing about it before hand is a rare gift. 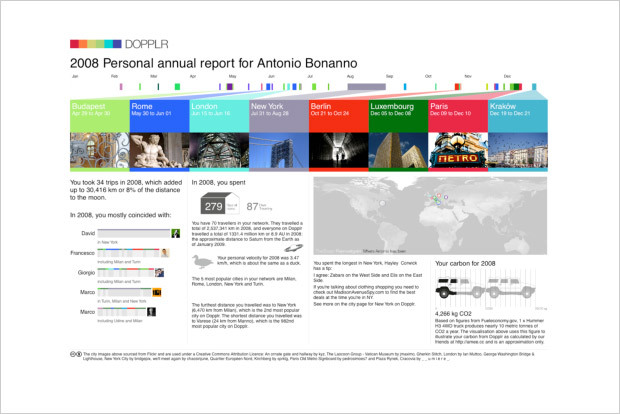 Dopplr´s personalized year report does all this and manages to move their brand one notch higher in their users hearts and minds. Hidden treats triggered by a secret code or input of some sort. Anything but a new practice. Common sense and good judgment should be applied if used though. Use subtle visual cues to create recognition patterns and more aesthetically pleasing interfaces. 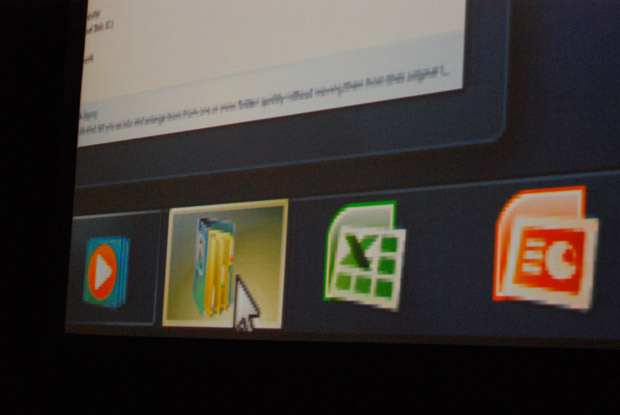 Windows 7 taskbar icons use an ever so subtle effect where the color of the icons glossy hover state is picked up from the main color of the actual icon. Fact is the brain constantly wants new imagery to process. Cognitive psychology states that our brains need stimuli to work correctly. Depraving us of stimuli that we are used to fairly quickly leads to sensory deprivation. Our need for new input is also a reason why we grow tired of projects with long life spans or why clients who face the same design every day feel the need for renewal. There is often nothing wrong with the concepts or ideas the design is built upon, it just start to feel old. This is highly comparable to how trends in fashion work. Read this great article on A List Apart for more information on eye candy and it´s effects. These are just a few examples I gathered for a presentation recently. Do you have any tips for reaching great enjoyability? Are you perhaps sitting on a treasure of examples? Sound off in the comments. Any and all feedback is welcome.